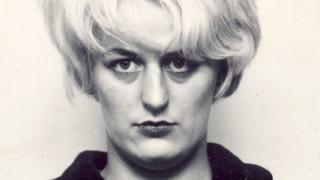 A new play in Manchester has cut lines about Moors Murderer Myra Hindley being "a true artist" and a "hero" for fear of offending the audience. The 1978 punk film Jubilee has been adapted for the Royal Exchange theatre. The film included the lines, but the stage version removed her name from its script days before Thursday's opening. Toyah Willcox, who was in the film and is now in the play, said the lines were "beyond disrespectful" in the city where Hindley and Ian Brady operated. The pair's crimes shocked the nation in the 1960s - they tortured and killed five children between the ages of 10 and 17. In the film, directed by Derek Jarman, a character named Amyl Nitrate used her opening speech to say Hindley "instantly became my hero" when she was 15. She also said Hindley was a "true artist" because she knew how to make her desires a reality, and dismissed those who said her crimes were "unimaginable" because that showed "the poverty of your imagination". Director Chris Goode, who has adapted the script for its stage premiere, said the lines were in the original film to show how punks deliberately wanted to shock society and smash taboos. He initially resisted requests to take out the reference to Hindley but was convinced to do so by a member of the "senior artistic leadership of the Royal Exchange" on Saturday. He said he had underestimated how the spectre of Hindley still stirred strong feelings, especially in Manchester, all these years on. "It seemed to me that if Derek [Jarman] could do that in 1977 that we must be able to do it 40 years on," he told BBC News. "I hadn't fully understood the way in which Myra Hindley as an icon and an idea has sort of become hotter over the intervening 40 years. That surprised me a little bit." The London-based director said those outside Manchester "hear that name in a slightly different way than for people to whom those crimes and those incidents had a much more immediate and local weight to them". The film and play are meant to be shocking - but Goode said he didn't want the rest of the show to be overshadowed if "everyone's freaking out about a small piece of material that occurs in the first 10 minutes". He added: "It's possible we could make a different decision about this if we were doing this run in London. "And there will be a run in London, and I expect we'll have the conversation again. But for now in Manchester it feels like there's a sensitivity there." In an interview to be broadcast on BBC Radio 4's PM programme on Thursday, Toyah said the lines would have been so offensive they would have "undermined the whole play". She said there had been discussions among the cast and creative team for weeks, adding: "We all agreed as a group who are performing and opening in Manchester, it was beyond disrespectful."